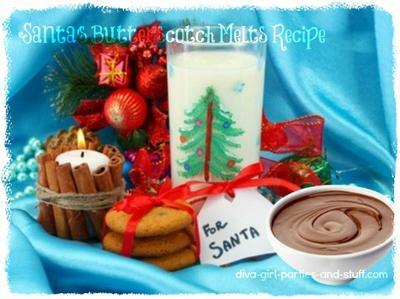 Be sure to leave a plate of Santa's butterscotch melts for the big guy. He'll savor them to the very last bite. Brush the biscuit trays (32x28cm) with melted butter or oil. With electric mixer, beat butter and sugar in the mixing bowl until it is light and creamy. Put in sifted flour and custard powder, stir with wooden spoon, then add water. Stir until it is all mixed well together. Take one teaspoon of mixture and gently roll into a ball - place on biscuit tray - repeat with the remaining mixture. Flatten each ball slightly with a fork. Bake for 15 minutes or until the biscuits are golden brown. Let them cool on trays. To decorate the biscuits, melt a pocket of chocolate bits in a bowl in the microwave and dip half of each biscuit into the chocolate. Place in the refrigerator for 10 minutes so chocolate will set.